For 40 years, Tradeline, Inc. has been providing highly acclaimed conferences and online exclusive reports to corporate, institutional, and government professionals for the planning, design, construction, and management of facility assets. Tradeline's conference series focuses on highly technical facilities on corporate, university, and government campuses. Packed with proofs, data, tools, benchmarks, and leading-edge thinking, Tradeline conferences deliver the latest planning, design, operations, and financial thinking for improved capital efficiency and productivity. Conference participants learn the latest plans and management concepts and build on the successes and lessons learned of others. 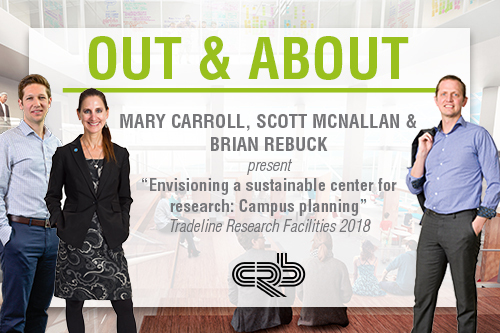 CRB thought leaders will present at Tradeline Research Facilities Conference 2018. Session leaders demonstrate through various projects how to envision a sustainable center for research that celebrates scientific innovation, with efficient planning and design that create light filled human centered spaces. They explore, from an integrated architects and engineers perspective, the various sustainable opportunities beginning 2,000 feet above the campus (site master planning) and zooming into the building and infrastructure design of the "bones" and the "systems" of a holistic center for research.